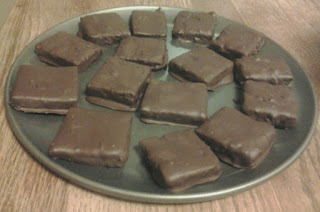 I got the idea to make these from seeing website that had gluten free homemade girl scout thin mint cookies. When I looked at the recipe I knew there had to be a way to make them healthier. So I adjusted a low glycemic brownie recipe by adding mint to it. I was pleased with the outcome but really wanted to know what others would think. So I took them to our Sunday school class for snack. They were received very well. Don't let the black beans scare you away from making these. You would never know there were any beans in them. Heat the chocolate bar, water, and dutch cocoa in a saucepan on the stove over medium heat, stirring until melted. When melted turn stove down to simmer to keep warm. Add xylitol, and baking powder (or the cream of tartar and baking soda) to the egg mixture and blend until smooth. Add in the vanilla and peppermint extract. Mix until blended. Pour batter onto a greased cookie sheet. Using a spatula spread the batter so it evenly covers the whole pan. Bake 15 to 18 minutes or until toothpick inserted into the center comes out clean. While cookies are cooling prepare chocolate topping. Melt chocolate chips in a saucepan over medium heat, stirring often. When melted add peppermint extract and stir to incorporate. Remove from burner. Cut cookies into 1 1/2 inch to 2 inch squares. I cut 5 across and 8 long ways to equal 40 cookies. With a long knife or pancake turner loosen each cookie from the cookie sheet. Cover a clean cookie sheet or a plate with wax paper. The next part can get a little messy but with patience it is well worth it. Slide a fork under one of the cookies and place it in the pan with the melted chocolate. Turn the cookie over and on its side to coat (I used a serving spoon to scoop the chocolate onto the sides of the cookie. Again using the fork lift the cookie up out of the pan and place on the wax paper covered cookie sheet. Repeat with the remaining cookies. I placed the cookies in the refrigerator for 15 minutes to help the topping to set. You can also put them in the freezer and they will set up very quick. They are very good frozen also. Store in an airtight container. Makes 40 cookies.